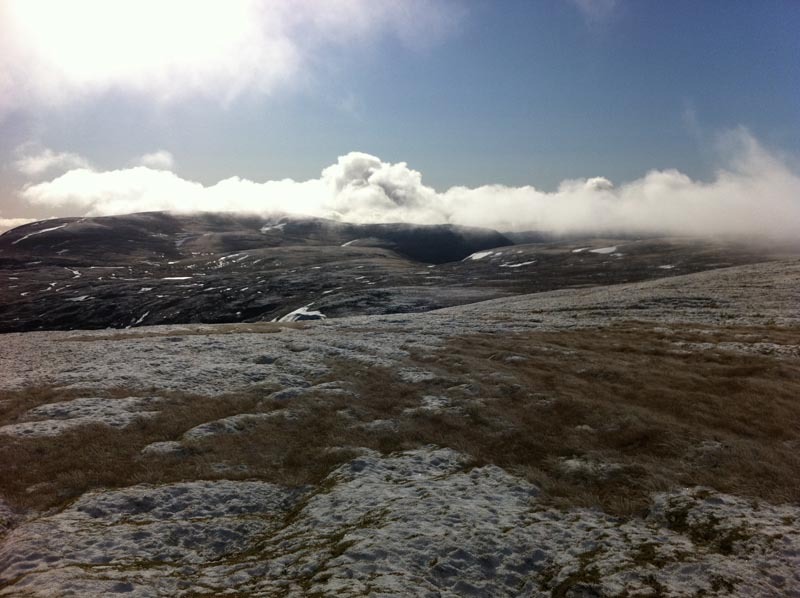 Meall a’Choire Leith and Meall Corranaich are two Munro’s deep in Glen Lyon to the West of the Ben Lawers group and can be added to the Ben Lawers Group for a big day in the hills. 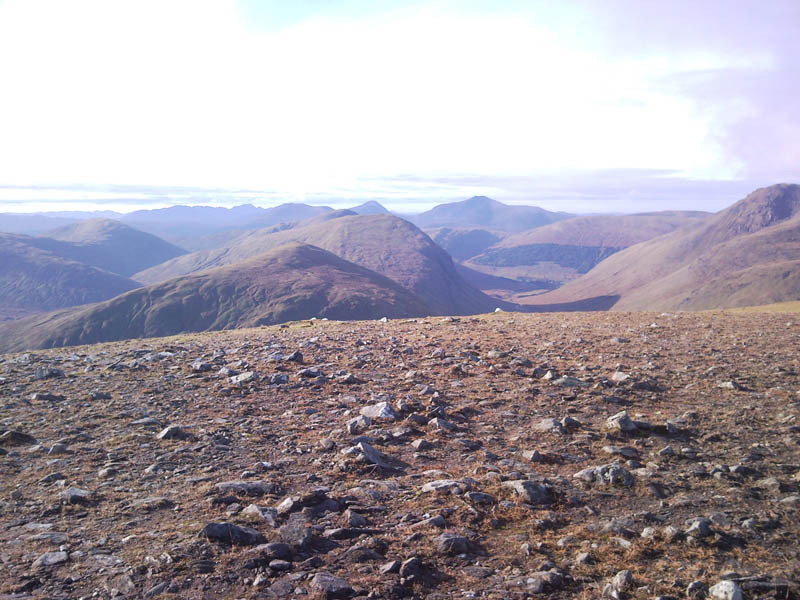 More often than not though these hills are walked as a circular route from the large Cairn just to the North of the head of the small Lochan na Lairige in Glen lyon. 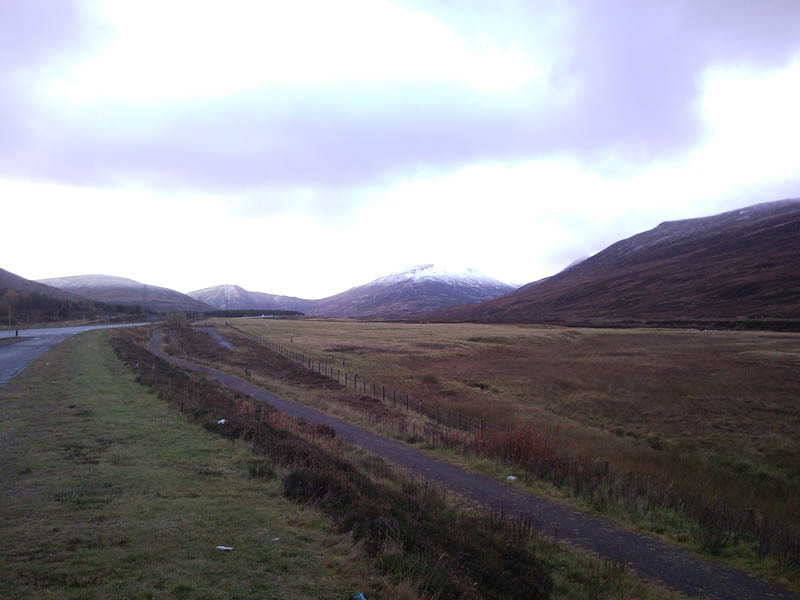 I had planned to walk these two Munros on Saturday but something else came up so I then rescheduled them for Wednesday. I was not so sure about walking today due to very strong winds forecast however nothing ventured, nothing gained and I could always abort if it gets too bad. 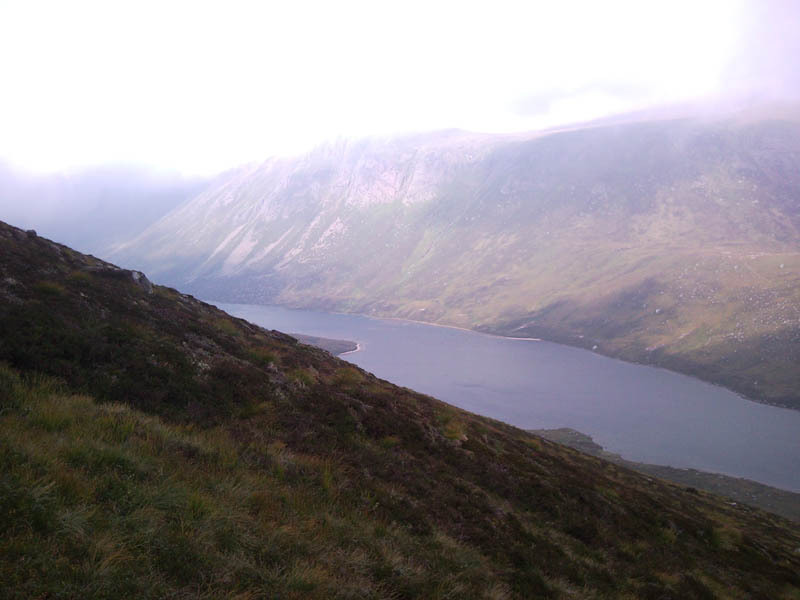 I left Dunfermline and headed up to Loch Tay leaving at approximately 0830, and I arrived at the car park below the large Cairn North of Lochan na Lairig at about 1035 and got changed into some walking gear. It had been raining for much of the journey but at this point the sun had come out and the rain had stopped so I thought my luck was in. I took a couple of pictures and then set of on my walk at about 1050. Basically my route should be as follows. A small climb up the short hill to the cairn and then head north east for about 300m until the line of fence posts is reached which are then followed pretty much all the way to the first summit. Now I couldn’t see a definite path from the cairn and the ground conditions were extremely wet and boggy so I basically headed east which takes you up the first small incline for about 600m, then I joined the line of fence posts. At this point the rain started and it continued for pretty much the rest of the journey. Its real peat moorland up here, with peat hags and pools full of water so gators are the order of the day not that they are going to do much good mind with so much water on the hillside. When I joined the fence line it was heading south for about 800m then south east for another 800m before sharply heading North East for the final 900m to the summit. It’s a little bit steep but it’s a short ascent with a reasonable path to the summit. As I was climbing along and getting higher the wind was starting to pick up. By the time I got to the summit the wind was gusting so strong I was down on all fours. I was thinking at this point that I would have to abort and go back down but after the initial shock I stood up into the wind and found that I was comfortable, albeit walking at an angle into the wind, and so I continued on my way. The fence posts head South East from here and I needed to head North. I was in no mood for pictures in the wind and the rain and didn’t want any of my gear blowing away with the wind so I continued over the summit of Meall Corranaich heading in the direction of the Meall a’Choire Leith. It’s pretty much downhill from here, with Meall Corranaich being the highest summit, so I was back into jogging mode and I jogged for 800m over the next spot height of 1018m and onwards. Now I lost the path here and it would be easy to go slightly North West down over Coire Gorm and miss the second Munro completely however conditions were just about clear enough that I could see the valley ahead of me and the path going to the second Munro, so I traversed slightly North then East for 100m to re-join the path. 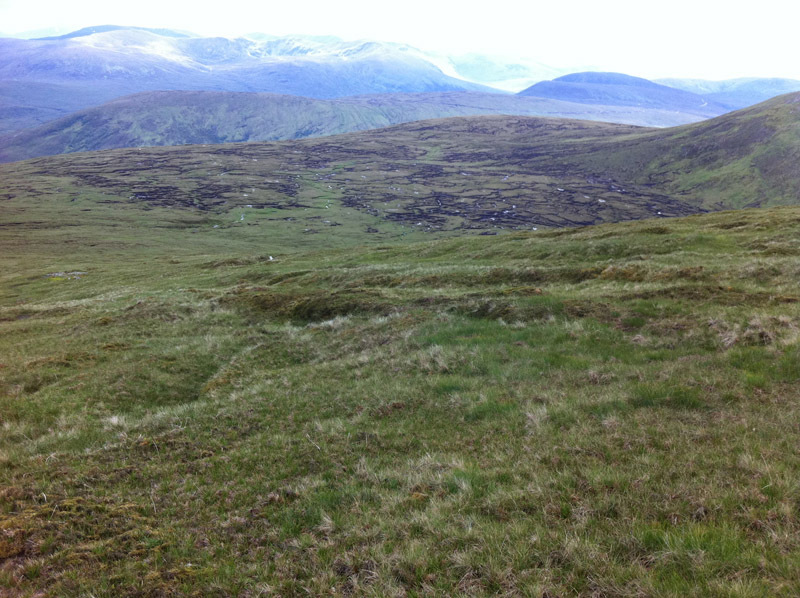 The path here is clear and the running is good until it starts to ascend the second Munro. The path hugs the ridge line most of the way on the ascent then veers off for the final 20m to the summit. Now the wind here was not bad so I took a quick picture of the cairn. I noticed another walker with a dog leaving the cairn and heading off down the hill as I arrived. With both Munro’s bagged it should now be an easy enough jog home. So I head off south west down the hillside catching up with the other walker and have a quick chat before continuing on my way. There doesn’t seem to be a clearly defined path initially during the descent but I did pick up a path further down after crossing the burn in Coire Gorm. However the path now heads South so I decide to leave the path and continue running South West down the Coire Gorm hillside. There are an increasing numbers of deep bogs as I descend and my feet were now soaking wet. I arrive at a small burn with a sluice gate of some sort and cross the burn here. This must be part of the dam system. It’s now only 1km back to the car but the underfoot conditions are sodden to say the least. At one point I drop thigh deep into a bog but I am soon back at the car and it’s still raining. Another car appears and a young couple ask me what it was like on the hill, great I say. lol. The truth was its probably the boggiest walk I have done to date and the lower slopes of this pair of Munro’s are not much fun in the wet. Certainly not a pair of Munro’s I would return to in a hurry.